Khadijah White ’04 (left) and David Wright ’69 speak with students about their experiences in journalism at the networking dinner, sponsored by the Alumni Council and the Career Services Office. Upper Tarble was buzzing with conversations among alumni of all ages and students of all years on Saturday, Nov. 7, at the Alumni-Student Networking Dinner hosted by the Alumni Council and the Career Services Office. Alumni who graduated as recently as 2009 and as long ago as 1955 came to campus to share their stories and advice with current students. 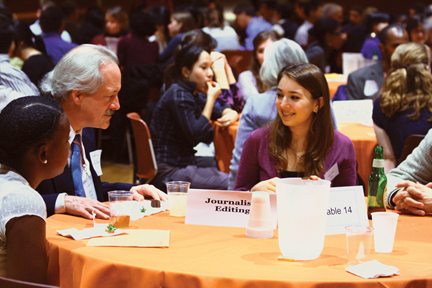 Thirteen different tables offered students information about a variety of career fields, ranging from healthcare to nonprofit work, and a variety of experiences, as told by more than 45 alumni. The alumni who attended were almost all members of the Alumni Council, a group whose goal is to provide a range of services to alumni, students, and the College administration. The Networking Dinner, which started more than 10 years ago, does not necessarily provide job or internship opportunities. “It is for developing networking skills and obtaining information,” said Laura Sibson, the assistant director of alumni relations for Career Services. 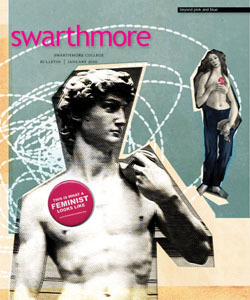 “This year, we focused on inviting local young alums [to supplement the Alumni Council members] because the students find the recent experiences of young alums who are adjusting to life after Swarthmore especially valuable,” Associate Director of Alumni Relations Astrid Devaney said. Alumni who graduated decades apart and who are separated from current students by several generations had distinct and often conflicting perspectives to share. Khadijah White ’04, with an entirely different background, including time as a production assistant for PBS, claimed that the future of journalism lies in an online-paying model through iTunes. Her comment elicited curiosity from Wright. “I’m a traditionalist. I like a print newspaper,” he said. Both journalists agreed that it was impossible to predict what the media industry will look like when this year’s freshman class graduates. “You guys are a whole new generation,” White said, even though she graduated only four years ago. Students at the journalism table also learned some tricks of the trade: “The first rule of journalism: If there’s free food, grab it,” said Michael Fields ’69, the news director for a radio station. The dinner was also helpful for students who were unsure about their future. “I don’t know what I want to do. But this was a great opportunity to hear about Swat grads’ careers,” Camille Robertson ’13 said. She sat at the nonprofit table. Robertson found that while younger alumni gave advice on how to start out and get involved in their area of interest, the more experienced alums talked about their own career paths and achievements. The dinner was popular among students, and Sibson said that this year it was bigger than usual, with approximately 100 students attending. The most crowded areas included the healthcare, consulting, and public policy tables.